Brenda Buxman has a history of making a difference in her community. As a longtime nurse in the Chippewa Valley with a degree in social work, Buxman is no stranger to difficult situations — and stepping up to fill a need. So when Buxman’s daughters began telling her stories of friends who were dealing with housing insecurity, she saw an opportunity to help. "I wanted to make a difference and this is a situation that I saw that could make a huge difference," she said. "And combined with the experience that my children had with their friends who went through all these difficulties, it just really opened my heart." At the end of last school year, the Eau Claire School District identified more than 300 homeless students, and 39 percent of the student body receives free or reduced meals, according to the Leader-Telegram. "That really just opened my eyes to the problem that exists here in my own community," she said. "Being able to give the children their own home just really makes a huge difference … and it makes family units more cohesive and stronger." Buxman started Warm Hearts Warm Homes Chippewa Valley several years ago to address housing insecurity for Chippewa Valley families. The organization’s goal is to provide rent-free housing to families while parents attend college — either at a vocational or university level — and are able to move into a career and become financially independent, Buxman said. "Talking to families, a lot of the problem that causes the situation is that they don't have the resources that give them enough time to really get on their feet so they can establish permanent housing," she said. But until this fall, she had no way to consistently fund it. So she took a leap of faith and combined two of her passions: giving back and coffee. 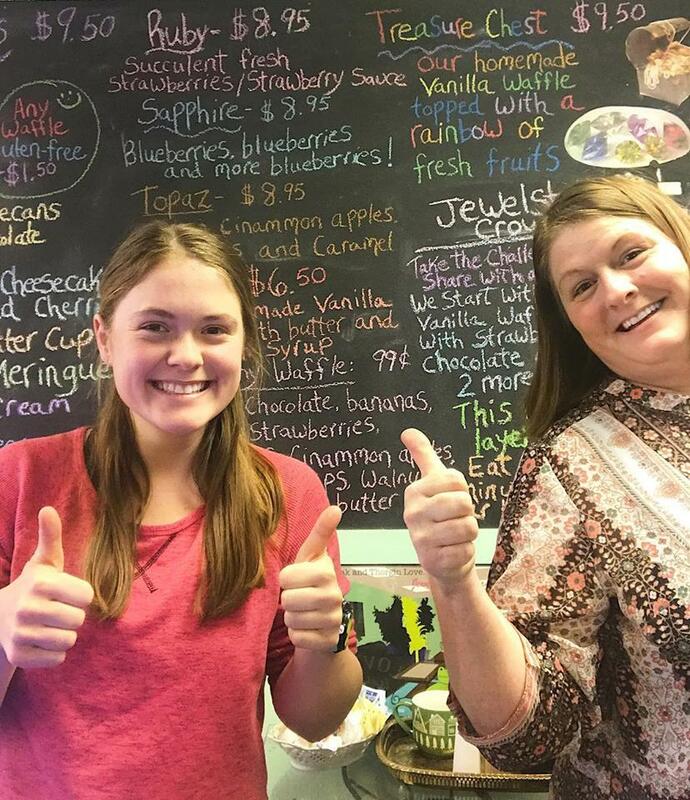 In September she opened the Jewelstone Cafe and Waffle Bar in Chippewa Falls, which gives 100 percent of its profit to Warm Hearts Warm Homes. The cafe, which Buxman runs with her family, serves nine different kinds of waffles, along with specialty coffee drinks. So far, the response from community members has been incredible, Buxman said. "I couldn't be happier on the commitment that I've seen Chippewa Valley residents have to help their neighbors," she said. Some have even offered donations beyond buying waffles or coffee. One challenge her customers have yet to meet ... finishing the triple-decker waffle challenge. Covered in strawberries, chocolate chips, chocolate sauce, bananas and whipped cream, a patron who finishes the three levels of waffles in 30 minutes gets their picture and name on the wall. "Nobody has been able to succeed at it yet," Buxman said. "Usually it takes about three or four people." Waffles are a breakfast treat to many people, but at one new Chippewa Falls-area cafe, they're also helping a few area families find permanent housing and connect them with the skills needed in reliable jobs. We talk with the founder of the Jewelstone Café and Waffle Bar for more.